Life is a lot more rewarding when wrapped in “we” rather than “me.” And for the record, adopting this ethos can turn you into the coolest couple ever. 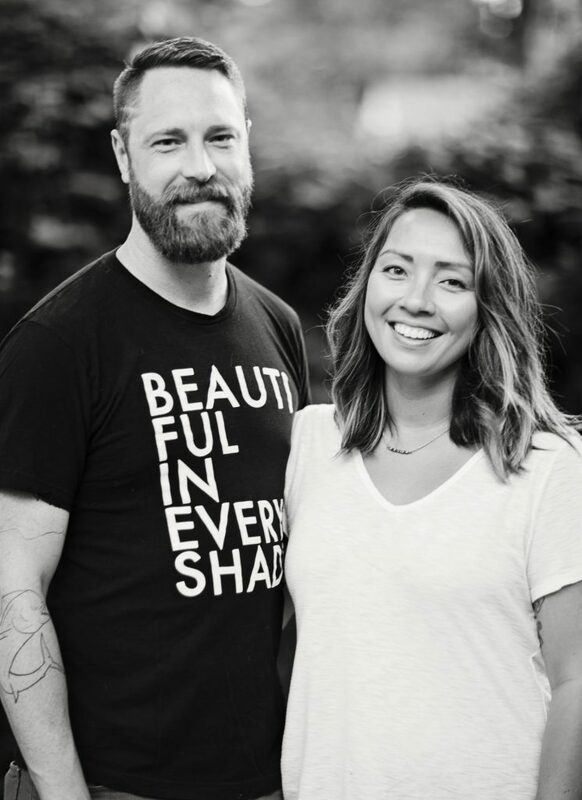 Together, Hana and Jake Elliot—co-owners of WHAT. Creative Group, a platform that supports artists and arts-based programs, put the spotlight on others and create movements bigger than themselves. I was lucky enough to get caught up in their world. Arts programming is critical to the future of our city, country, and world. In the first of an 18-part series about the Nashville Quilt Project, the Elliotts describe how the Nashville Quilt Project came together as the perfect storm. Through the completion of a 50-foot canvas , Hana and Jake tied the community together from start to finish. (The mural is an offshoot of the Off the Wall campaign on Charlotte Pike, founded by artist and activist Tinsley Dempsey.) For the public art project, the Elliotts partnered with four nonprofits—Poverty in the Arts, the Oasis Center, Room in the Inn, and The Park Center—to highlight their programming and its participants. The intention of the collaboration was to connect the city’s creative silos and shine a light on those who view art as their savior (and a technique for overcoming the trauma they have been through.) Officially funded by means of crowd sourcing, the Nashville Quilt Project prompted the community to take stake in their city. It also drew attention to underserved communities, such as the homeless, mentally ill, and at-risk youth populations, and recent budget cuts to federal arts programming. As they discuss the theme of their mural, “What does Nashville mean to you?,” it is clear that connection is everything to the pair. A sense of belonging is critical to their happiness—individually and as a unit. Lots of couples eat potato chips on the couch in the evenings. The Elliotts love nothing more than to spend their free time (he is a hydrologist by day, she a marketer) envisioning and executing ways to engage with their community. While they might be vastly different in their personalities, Jake and Hana possess a common desire: to make the world a better place. What do you want others to know about this project? Jake Elliott: Many of our artists see creativity as escape from the hardships they’ve experienced. The nonprofit arts programming is the only thing they look forward to all day long. More than their individual talent, I was interested in the motivation behind their pieces. It was truly amazing how original each concept turned out. What can us locals do to bolster Nashville’s creative community even more? Hana Elliott: Buy art and engage with the local arts community. JE: Encourage the government to support unconventional ideas more often like setting up a wall on which kids can spray paint. Jake, have you always practiced art? JE: While I was always a woodworker, I never recognized the fact that I was an artist. Oddly enough, my great-grandfather, nick-named “Signs,” painted murals like me in East Nashville. I still think it’s amazing that I’m doing the same thing in the same place decades later. Was art important during your childhood? JE: Not at all. I grew up in a very conservative area of Tennessee where art was seen as a waste of time. “You should be working!” was a common mindset as art wasn’t seen as a realistic way to provide. How did life change when you two got together? JE: Dramatically. I met Hana in 2012 and she introduced me to city life for the first time. It was a true awakening. While I’ve always had big ideas, she was the first one to take them seriously. By being with her, I learned how to execute them. Shortly after we started dating, I was commissioned to paint my first mural at The Post East. During the process, she and I became friends with a lot of the neighborhood folks and even created an event where anyone could come out and paint. That was the first “aha” moment where we both thought, art is a tool to create positive change in the world. Most think of the artist creating alone at their studio so the idea of bringing others into every element is interesting to me. JE: In my experience, you are what you do. If we’re going to put on our Instagram account “We specialize in public and community art projects” then that’s what we gotta fulfill. When you use your passion properly, you can create big changes within the community. HE: The best part of the Nashville Quilt Project has been hearing how much arts programming impacted individual lives. In my professional life, I manage a team, think about our business goals, and how we can support them. WHAT. Creative Group is a natural transition for me and since joining I’ve simply pulled pieces from different jobs and experiences to make Jake’s dreams a reality. JE: I ask her opinion on everything because I respect it so much. Her role goes deeper than advising. Also she’s an amazing artist herself. What are the challenges of working together as a married couple? HE: I have a tendency to be bossy. (Both laugh) He knows it’s true! Even before we started working together I’d always be asking, have you thought about this? Have you thought about that? JE: That was hard for me at first because I’d never had someone helping me as much as she did. Still, I began to think, maybe I don’t know what’s best all the time. I started to listen to others, which sparked my love for collaboration. HE: We’ll scuffle from time to time but that never makes me less grateful that we have this thing to do together. JE: Our favorite activity is to sit around and cook up ideas about how to improve the state of our city. Why do you have such a fondness for collaboration? JE: Most artists have overcome one obstacle or another by means of their creativity. I would rather tell other’s stories than rehash my own. (Laughs) We’re all on this earth to make it better. Hopefully what we do with WHAT. Creative Group echoes throughout time. HE: Also, to have a message behind every piece is much more fulfilling. It’s fascinating, not to mention eye-opening, to work with other artists and learn what it’s like to be homeless or a young Muslim woman. Through our work, we grow as people everyday. JE: Pride is a great feeling— especially when you can share it with the one you love. That’s got to strengthen your relationship. Every project is a hustle in terms of finances. Why the crowd-funding model and is it the wave of the future? JE: It’s not sustainable. We worked our asses off—you included—to hit our goal. Let’s say we cashed in a lot of chips. HE: Fortunately, we were so pleased with the support of small businesses like the Frothy Monkey, The Post East, and Midtown Construction as well as the individual donors who sponsored our project. Hopefully their enthusiasm for what we call “a self-motivated exchange of value for value” rubs off on the rest of Nashville. While this project was a leap of faith, the community absolutely came through. It was amazing.